Art is broadly divided into three parts, space art, time art, and linguistic art. The fine art, we simply call so, consisting of architectures, sculptures, paintings, and other decorations is classified into space art. The art is ordinarily recognized by materials used with these; in fact, this viewpoint is over inclined to the side of producer. At present the role of appreciator is considered more and more. In such times the point of analysis such as time and space can lead to have a prospect of artistic activity and works totally through both sides of creator and appreciator. By this, the theory on art satisfies creator and appreciator together can be built. “Thinking on Space Art” is the first trial written to supply such a demand in all the area of fine art. In case that a certain painter draws his/her work, he/she intentionally pours total personality into it. However, at the same time, his/her existence is surrounded with whole setting of stage makes the times when he/she has been brought up. This incompatible duality is clearly marked into his/her works. And then interpreting his/her works from this duality might become an indispensable key for full understandings of them. Such understandings about works have hardly been gained so far. Only prosaic enumeration of facts by biographer or arbitrary pressure of taste by critics has influence over persons. This thesis will present such two as the thing forms painter and the other produced by painter together with the analysis about special tools he/she uses. This trial has never been done by aesthetician, artist or art historian, and will include all the things they can do as well. 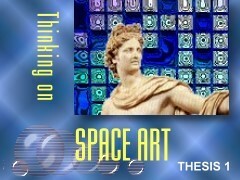 As for “Thinking on Space Art”, “Principle” as Part 1 has already been uploaded to this site now. This thesis is consisting of three parts. Succeeding to “Principle” part, “History” as Part 2 and “Manifesto” as Part 3 will be scheduled to be written. Moreover “History” part is divided minutely into three chapters such as “Ancient Art”, “Mediaeval Art” and “Modern Art”. We will upload these in order. If you wait in expectation for final completion of “Thinking on Space Art”, we cannot find more pleasure than this. In case of understanding some artwork, not limited to painting, if whole mind of production is not surveyed totally, useful result will never be gotten, as long as it is a product of mind of human being. The artwork appeals strongly in sense. It thus concludes that it sometimes deflects the subject of appreciator to some direction. In a lot of cases, this leaning will hinder a correct grasping of artwork. However, only mechanical analysis like a numerical formula has never force to realize a power of work and it only provides a counterfeit like swimming on a mat. Saying by another word, it is the same thing as planning a vain trial intending to tell feelings of a person in his/her life with showing an anatomical chart. A lot of Internet sites about artworks make the role of either displaying works disorderedly and having devoted all to the sense of appreciator irresponsibly, or publishing enormous information of text and dealing with living art as objects for the archaeology Pinakothek and withering them in it. The recognition of human being is formed with acting of intuition on two of reason and senses. The existence of work moves a sense, and the analysis satisfies reason, and thus a necessary condition for correct recognition is fulfilled for the first time. The intuition of appreciator acts there and will deepen recognition. Then, only this intuition should be put out under the responsibility of appreciator. 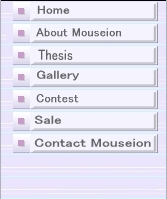 Mouseion site will display almost works of some painter and the brush of the painter is filled up with text information in the form of thesis and we link these two functionally. With this exertion, this site will contribute the forming of the above-mentioned necessary condition of recognition in our responsibility. The gallery page displaying works sharpens your sense and the thesis page analyzing works and painter will awake your reason piercingly. When passing through these two, you must be able to have a master’s eye of insight about one painter. I have been spending a lot of time of life in the world not concerning with art especially with fine art. It is the reason why doing so that for me the art was reflected as an intolerable evil thing in the point of arrogance in judging the world by a pure personal taste. However, on the other hand, I have been possessed by inerasable appeal of beauty rises from the back out of my mind and have been at the mercy of its overwhelming power. When I was thrown out in gorge of this absolute self-contradiction, I had noticed that only digesting completely the beauty, the value substituted for nothing, in my consideration was necessary for me to solve this. My consideration spread out concerning philosophy and theology on the basis of jurisprudence and turned to the place to integrate these both in the new form. Then, as for the considering about the beauty, it unloaded an anchor mainly to one corner of axiology in philosophy. In this way, my art philosophy was gradually settled in the bottom of intellect through the practice of continuous consideration and when it reached a certain critical point, it spouted out to the surface as becoming new writings. Those results are theses carried on this site. Then, these results are formed newly every day in the form of present progressive. Today, with the progress of Internet, this solitude effort of mind can be connected directly to the place where a lot of people share this experience at the same time. Then, this simultaneous experience will cause new flow to the world both mentally and materially. Locating myself in this new wave motion together with readers and being able to have an experience filled with the thrill that a pure personal work becomes social phenomenon at the same time is great pleasure for me. This thesis is written to become the origin of coordinate axis for all the style of art, in other words, it is also written to become the polestar and to lead creators and appreciators. However the fundamental spirit of this thesis is denying nothing except for the attitude of denying others, so that it does not lead people to some direction. Its purpose is becoming the best compass. 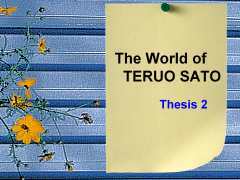 When all creators and appreciators pick up this thesis, if it will become a most trusted map in the process of walking an unexplored wilderness, the investigation into art, the intention of author might be fully satisfied. If "Thinking on Space Art" is the polestar of all art, this thesis will become a searchlight when surveying complicated internal world about a specific painter. The methodology of "Thinking on Space Art" is applied to this thesis and moreover this thesis complements it. With plenty of illustrations and detailed explanations by text, reader will be able to touch the total figure of painter at any time in rounding a long corridor like a museum in the head without regard to time limitation and a queue of others. Then, if this thesis will become the best reference book when a creator takes a paintbrush in reality and a manual for an appreciator to confirm the meaning of actual impulse from a specific work, the huge energy which author invested here might be repaid. If anyone will have a question about any part of all the text carried in this site, please inquire with E-mail by sending to following address. Incidentally if anyone will have a question to Taketoshi Murayama, writer of this site, about his personal thoughts and opinions except the text carried in this site, please inquire with E-mail by sending to following his private address.